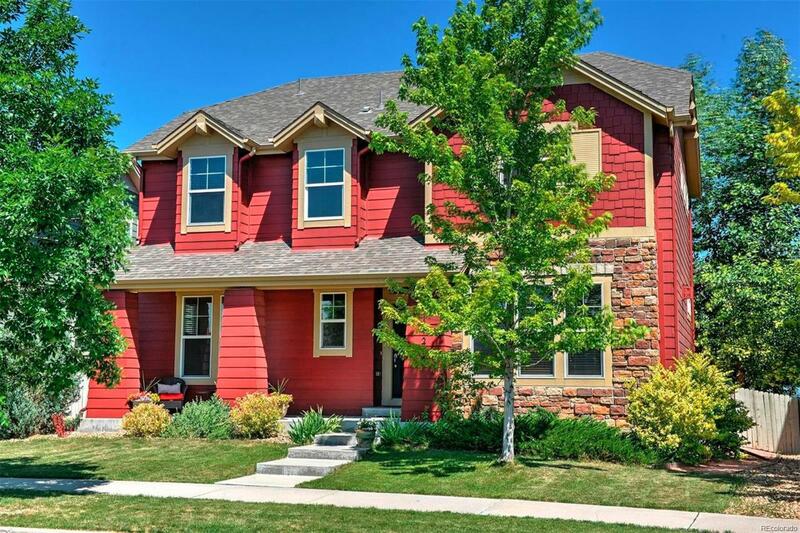 This beautiful McKay Landing home is walking distance to all 3 top-rated schools. Also close is amazing dining and shopping. Easy Boulder/Denver commute. Neighborhood boasts a brand-new bike park, walking trails around the lake and multiple playgrounds and parks. The home has hardwood floors on the main level, brand new carpet, and upstairs bathrooms have been updated with wood look tile and new shower doors. There are four bedrooms upstairs including 2 master suites with oversized walk-in closets. The basement has been finished to include a wet bar with farmhouse sink, quartz countertops and refrigerator/freezer. Basement also has full bath and a bedroom with walk-in closet. Outside you can enjoy privacy with mature landscaping, relax on your oversized deck while the kids play in the safety of the back "alley of the house where rear-loading garages are accessed only by homeowners. Home has been pre-inspected, home is in great shape and Seller will provide a Home Warranty.